Have you been thinking about blogging but not sure if it will help your business generate new leads? In this post I’m going to share some pretty compelling data and real case studies of how maintaining a blog on your website can payoff big time in terms of creating new business opportunities for your company. Let’s begin with some background. Every year since 2009, online marketing think tank Hubspot has surveyed businesses in order to compile a marketing report that documents trends in the online marketing industry. 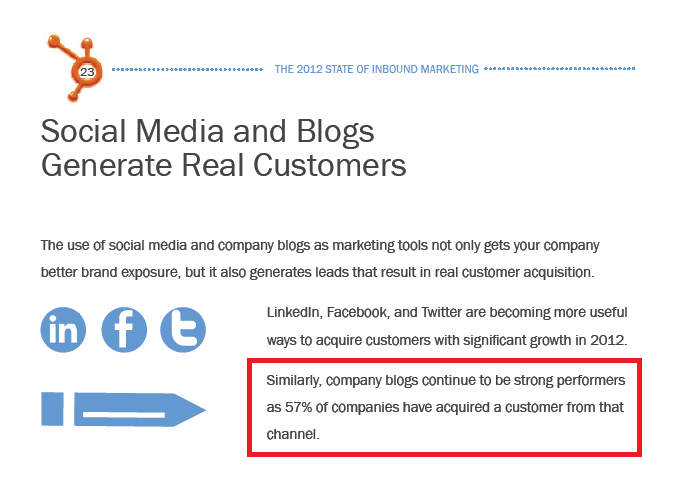 According to “The 2012 State of Inbound Marketing”, blogging is the #1 form of inbound marketing, as favored by 972 respondents. The respondents were made up of marketers, owners, and business executives familiar with their company’s marketing strategy. 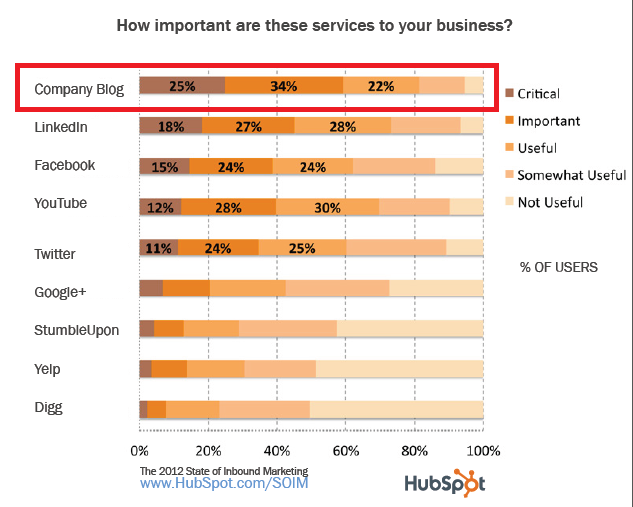 With 81% acceptance, the chart above reveals that companies feel that blogging is more important to their success than popular social media channels like LinkedIn and Facebook. What’s more, 57% of businesses report that their blog has led directly to a sale. My friend and associate, Brendan Egan, relies on his SEO blog to create over 70% of his new business leads. He reports that his website is receiving “100-150 visitors per day” and its because of his blog that new prospects are finding him online. As a result, Simple SEO Group’s sales volume has steadily increased every month since he started blogging on a regular basis. 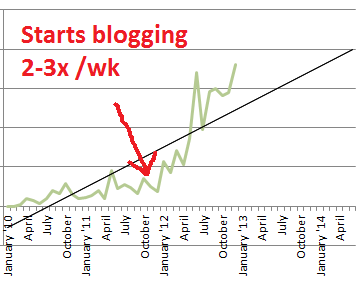 Brendan has been blogging 2-3x per week since November 2011. You can see how his commitment to blogging has increased his revenue. Recently, I interviewed Wade Harman, owner of Bloggers Make Money to see how he built his blog and database from nothing in just 9 months. I first met Wade in 2011. He hired me to help him with some SEO work on a mining equipment website he was working on. His fascination with internet marketing led him to create his own site which is dedicated to helping people learn how to make money blogging. He’s a full time blogger and an award-winning social media marketing consultant. He has worked with high profile clients such as Wordpress and HubSpot to strategize a social media presence. MM: When did you start your website? Wade: I started in April of 2012. MM: How often do you blog? Wade: When I first started I was so excited to make money that I was blogging almost everyday. Now that I’m a little more experienced, I have learned that you can’t create great content every day…I don’t care who you are. If you’re blogging by yourself it’s almost impossible! I now post 3 times a week. MM: What sort of monthly traffic do you get? Wade: That’s kind of a hard question because it really is up to different things: a)how much I post to social media b)how well I have optimized posts c)how many followers I have gained that past month. Usually my traffic ranges from 15k-22k per month but that’s not set in stone. It could disappear tomorrow. The main thing that you want to do when creating a blog is to stop worrying about SEO and social media and start building relationships with other bloggers. These lead to a connection and a community that brings more opportunities than what you could drum up by yourself. Build a following. That’s what’s important. Then you don’t have to worry about whether or not your traffic is going to fall off the map that month or not! MM: How have you promoted the site? How have you built a community? Wade: At first, I was using article marketing sites like LinkVana. I was building links left and right, trying to get my site and posts on the first page of Google. I did some random social media posting here and there. Now, I really don’t focus that much on SEO. Really, as far as SEO goes, the only thing I do that would count as linking back to my site is natural things like commenting on other people’s blogs and guest posting. This really goes back to building relationships. The best promotion overall is to make friends in the industry because it leads to different opportunities ie, guest posting, blog post mentions, community traffic, etc. One of the best promotional tools that I use is a plugin called CommentLuv. It allows you to post your latest blog article when you comment on someone else’s site. When you post comments on blogs that have the CommentLuv feature, it allows you to do this. The DISQUS commenting plugin is also a good one for interaction as well. Another thing that you can do to promote yourself well is to get established on the Google Authorship Markup. This is when you are verified on Google. You ever see people’s profile pics beside their links in the searches? That’s what that is. 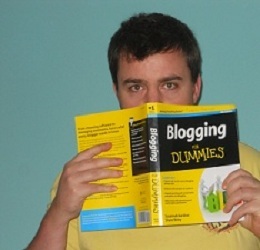 WordPress has a great Google Authorship plugin and you can see what I mean in this post. One of the best promotional tools that I use is a thing called TweetAdder. Granted, it’s a Twitter tool, but you can connect your Facebook to Twitter and post 24/7 to these two platforms! Becoming visible is the key to a successful blog and this can really help you! I am a true advocate of social media sites. You can use tools like I just mentioned, but if you’re not engaging people, then it’s of no use. The best promotion is YOU. I have pointed out some great social media marketing tips in this post. MM: I remember you telling me the $$ was in your email list – whereby you promote products – how many subscribers do you have? Wade: As of now I have almost 10k subscribers. The money IS in the list. However, it’s not going to be in the list for a long time! You can’t just place a subscriber opt-in box on your site and watch it magically fill up with people. There is some work to be done. For newbie list builders I have written a post about what list building really is and how you can bring in more subscribers faster. Even though getting them to subscribe will eventually become easier, you will find that you can’t just throw any old affiliate link at them and watch them buy. Remember, they opted in because they either trust you or wanted that freebie that you were going to give them…guess what?? Most people just want the freebie. So when I promote products through my list, I only promote products that I use. Products that I know are really great and can help people. This is not a soap box for you to throw crap affiliate links at your subscribers. That’s a great way to launch you right back at “square one” because they will unsubscribe in a hurry! As you can see, by immersing himself in blogging and social media marketing on a regular basis, Wade has built himself a very profitable business from scratch. After seeing the data and looking at real life case studies, I hope you can see how maintaining a blog for your business can help you get more visitors and increase sales. For Brendan, Wade, and lots of other businesses, it’s an essential part of their marketing strategy. Blogging and content creation services are a key ingredient of the online marketing system we use to help your business increase sales. Call us for a free consultation and learn how maintaining a blog can help your business grow.